The Timeline Widget – Hey. Ask us anything! The Timeline View is a great way to see all your tasks in one place and where these tasks are being worked on. 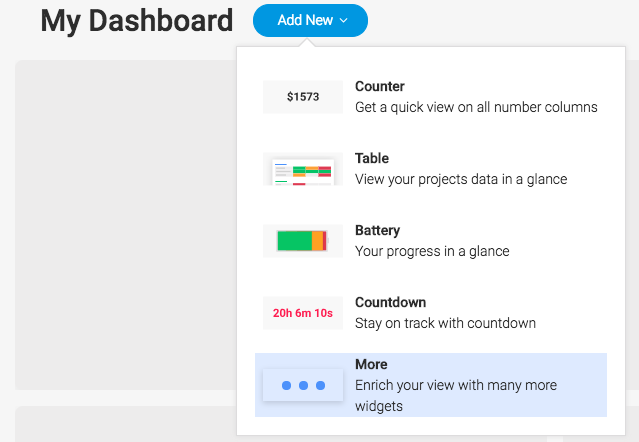 With our Timeline Widget, you can now pull timelines from several boards and gather them all in a single view! This widget is a must have to enhance your workflow! Keep reading to learn how it works. From the drop-down list, click "more" and then choose the "Timeline" from the Dashboards Center. Click on the settings button and choose the boards you would like to include in your timeline view. Each item inside the view will be a unique color according to the board from which it originates. You can choose to group your Timeline Dashboard by your Person or Status columns, or simply by boards or groups. If your boards have multiple columns on them, you can also select which columns you'd like this widget to include. Below, I've chosen to group by "Person" and have selected all timelines across the boards I selected in Step 1. You can also pick which specific group(s) on each board you'd like to see in your Timeline View. You can select all the groups on each board (as below), specific groups, or just the group currently at the top of the board.